In Hindu mythology, one of the critical significances of fire is its role as an agent of transformation and purification. Through cremation, fire becomes the eclipser of the soul from its lingering attachment to its body. In brief, death by fire through the work of the incandescent flame is good fortune. And, in Hindu theology, the goddess of good fortune is the four-armed beauty, Lashmie (Laxhmie), the "queen of light" who is worshipped overtly at Diwali, the festival of lights symbolized in fire. THE recentdeath by fire of Ms. Laxhmie Kallicharran at her residence, despite her efforts to escape, seems as much a stroke of karmic fate as it is tragic. Her death has left Guyana short of one of its most vibrant, prolific, and creative of cultural activists, and of course, unquestionably, the biggest lost to the arena of Indian culture and the renaissance of Hinduism in Guyana. Guyana cannot afford such losses, especially of a woman who confronted, defied, and altered cultural, gender, and racial appendages in a society where both our national “Guyanese” and Indian cultures have struggled to come of age since independence. AS a researcher, librarian, and cultural pioneer, Ms. Kallicharran’s legacy has resulted in a sense of appreciation for the oral traditions in Guyana, folklore culture, and the transportation of Indian culture from the rural villages to the national stage. She promoted shows, concerts, staged a one-woman exhibition on Indian indentureship in 1980—the first ever held. There have been numerous books about Indian heritage that she co-edited, such as They Came in Ships, which celebrated the 150th anniversary of the arrivals of Indians in Guyana. Then there were the many radio and TV programs (e.g., “Caribbean Massala”) she produced and, of course, her grooming of Guyana’s Chutney music into a national competition held during Mashramani (albeit ceased now), which is now part of the annual celebration of Indian Arrival day apart from being a recognized art form. EQUALLY admirable is the zest and sense of defiance to the expected roles of women with which she etched out her work; as early as a teenager growing up in Berbice, she drove her family’s car (a mini motor) in a time when women, especially Indian women, were not accustomed to such liberties, particularly if she was the daughter of a pandit. Twice married and divorced, Ms. Kallicharran once credited her feminine individuality to one of her grandmothers who lived alone and fended for herself. 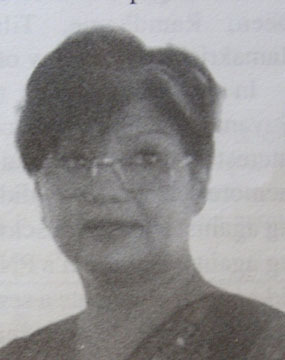 As a librarian at the University of Guyana (UG) and one who held a degree in sociology from UG, both her academic qualification and job skills were funneled into extensive historical research and projects that eventually led to benefits for all Guyanese. In addition, there is the supportive role she played in the exploration and proliferation of non-Indian cultures, especially their local offsprings. IT is difficult to write good things about public figures, as it is difficult to write about public tragedies. In this case it ought to be easy, yet it gives me no pleasure to write about the exploits of Ms. Kallicharran, because the acute loss both personal and national, shatters whatever gratitude Guyanese, especially people of Indian descent, are indebted to pay. I personally owe her more than I owe any pandit or other Guyanese public figure, Indian or otherwise for my sense of cultural history and purpose. I remember seeing her on stage many times, distinct, professional, unembarrassed about the "pagan" culture she was promoting. 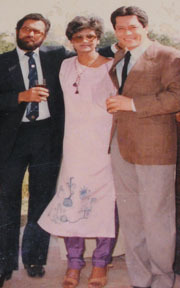 In very straight foward language, when Ms. Kallicharran appeared, it was fine to be Indian or a Hindu in a public space (and yes folks, there has always been a lingering sense of shame among Indians, especially Hindus and Muslims when their religious views were being exercised on the "national" stage on Guyana, a Christianized society). No one group in Guyana owes so much to a single cultural worker as the Indian community owes her. She has single-handedly made events such as the Diwali pageant and Eastern dress wear acceptable in the public, national domain, especially during decades when the Indian community in Guyana was at great odds with the pro-black state government. AT the least, I expect a memorial to be constructed in her name; I expect a street to be named after her (also for Mr. Andrew Murray, Guyana's Commonwealth and Latin America's ex-weltherweight boxing champ who died 2 days after Ms. Kallicharran in an auto accident in the midst of promoting a boxing match); I want future generations to ask about her. I want young Guyanese women to remember that the future is their to smash and recreate;that they ought not to be done in by a patriarchal order of society. I want this to be a tradition for our leaders and people who contribute enormously towards the development of our national cultures; there are, as it is, too many streets and villages named after people who were never Guyanese; Den Amstel, Vreed-en-Hoop...We have to change this now. BUT what good is public applause, a poem of praise, or the change of a street’s named to honor one? These are somewhat trivial matters; what matters is for one to recognize that the wheel of life spins on, that what has been will continue to be; Ms. Laxhmie Kallicharran is and isn’t, and that death by fire is not tragic at all, but fate fulfilling itself. Her work is done and her life spent. Now begins the work of those of us who have been slumbering, making the same excuses, speaking of the “need for changes” but neglecting the necessary actions. While belief is good, action crystallizes belief and changes the world for the better in a gentle way. There is too much babble among us Guyanese and less real action that ought to be. There is much work yet to be done to improve Guyanese culture and all its facets. I believe this is how we can best tribute Ms. Kallicharran; she would like it to be as such; no boundaries outside and those within to be altered as she has been transformed by fire.